HitBTC is a leading European bitcoin exchange which provides cryptocurrency trading services to institutionals, merchants and individual traders worldwide. The trading platform was founded in late 2013 and is under operation of Ullus Corporation. HitBTC provides trading operations for the most popular digital currencies (BTC, LTC, DOGE, QCN, NXT, FCN, BCN, and XMR) and prevailing fiat currencies (EUR, USD). For fiat deposits/withdrawals within the European Union, SEPA transfers are available and wires from other countries are accepted as well. HitBTC declares it's main focus on implementing cutting-edge technologies to cryptocurrency trading. The core matching engine is stated as the most advanced technological product in its class. It implements real-time clearing (T+0 settlement), advanced order matching algorithms and has been acclaimed for its fault-tolerance, uptime and high availability. The HitBTC platform development started in 2013 with a 6 million USD Venture Capital investments, as of the collaboration between software developers, finance professionals and traders. In February 2014, HitBTC was officially launched with the following instruments: BTC/USD, BTC/EUR, BTC/LTC USD/EUR. 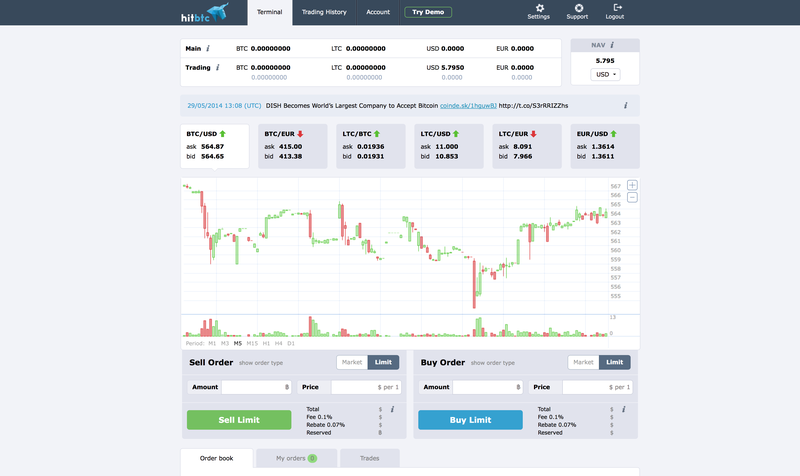 In April 2014, HitBTC released Comprehensive Demo Trading, a special trading feature that allows for testing trading strategies and adjustment of API settings. In May 2014, HitBTC launched altcoins voting program aimed to allow the community decide which alternative cryptocurrencies should be added to the market. In September 2014, HitBTC was included in the TeraExchange Bitcoin Price Index . The core matching engine is among the most advanced technological products in its class and implements innovative features such as real-time clearing (T+0 settlement) and advanced order matching algorithms. HitBTC’s dependable API is extremely stable and will satisfy the needs of algorithmic traders and provides an easy back office integration. It is compatible with HFT set-ups, and algorithmic trading systems. To satisfy the needs of institutional clients with existing systems HitBTC is accessible via the FIX protocol. HitBTC currently accepts account funding in USD and EUR. SEPA payments are processed the same day and are charged no commission or processing fees (available for EUR only). International wire transfers (SWIFT) are also accepted and the processing time ranges between one and three days. New coins are added to HitBTC exchange as a result of user votes or market makers' activity. The first coin added by winning the coin contest was DOGE  and the latest one to win the challenge was community-vote driven NXT coin . Presently HitBTC features over ten currency pairs, including BTC/USD, BTC/EUR, LTC/USD, LTC/EUR, LTC/BTC, EUR/USD, EUR/GBP, GPB/USD, DOGE/BTC, XMR/BTC, BCN/BTC, and NXT/BTC. With responsive and feature-packed terminal users can trade effortlessly any of the currency pairs in milliseconds. Bids and Asks are updated in real time, and the chart running on the page is quite solid. With this new feature users now can explore markets effortlessly. Anyone is allowed to check the very latest market data, charts, and order book, without having to log into an account, providing extra convenience. Market Maker contracts permit API traders to maximize their trading experience. The contracts are accompanied by cash incentives and rebate bonuses. Traders have the opportunity to add a new currency to the exchange if two users take Market Makers contracts to support the cryptocurrency on HitBTC. Every contract is valid for one currency pair. 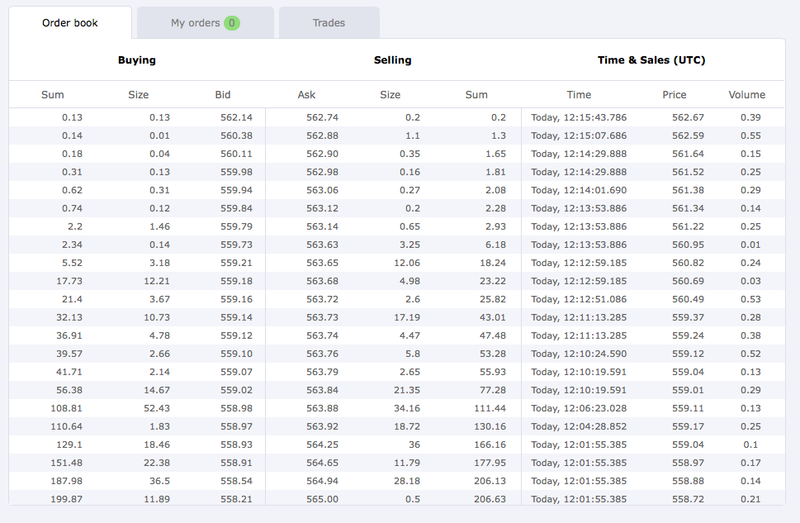 Market makers are sent detailed daily reports with order book snapshot to help them evaluate their performance and develop the most efficient trading strategies. The market making activity is closely monitored and existing contracts are reviewed every month. The newly launched HitBTC CryptoCoin Price Ticker widget can be added to any site, blog or article for an easy overview of the current price on cryptocurrency trade pairs from HitBTC, the present ask, bid and 24 hour value. Users can select their preferred size, color and currency and can configure which pair will be shown by default. HitBTC firmly believes that e-currencies with true potential should be given a chance to be supported by a major exchange via popular vote. For that reason, HitBTC has introduced a voting system where a particular coin can be included in the list through votes from users and guests. To vote, users need to visit the voting page , look for their preferred e-currency and click the vote button. If you don’t see your favorite cryptocurrency on the list, you can always nominate it by clicking the suggest currency button. This page was last edited on 18 March 2015, at 01:14.